LINZ Surveyor Field Book of the Gisborne area from May 1913. We recently found a photograph in one of the 13,000 Surveyors Field Books we have been digitising. The book was dated May 1913 and has a title on the front cover “476A Gisborne John Roddick May 1913” which is unusual for these field books which are typically titled with only a number on the spine. Our team were captivated by the discovery and conducted some research to find out who was this man in uniform and if it was John Roddick himself. Following some investigation through Archwaywe found information on the surveyor John Roddick. 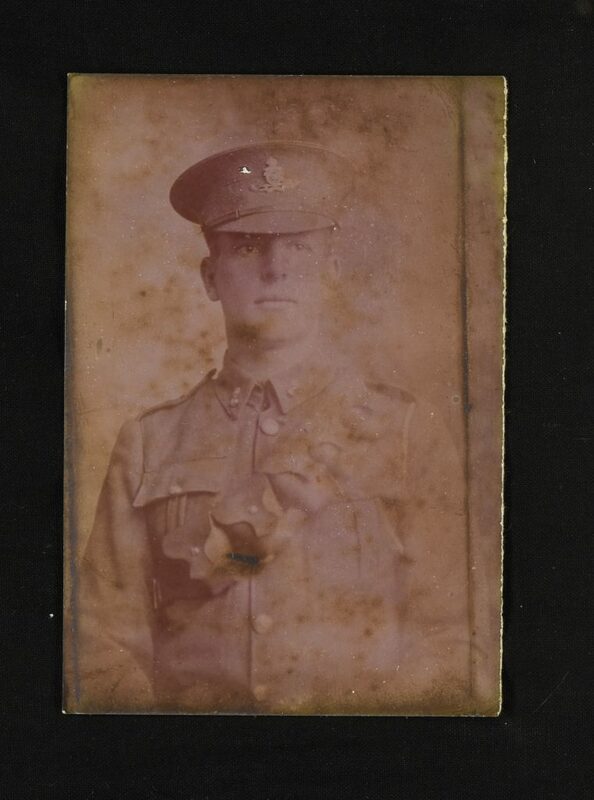 He obtained his Diploma as an authorised surveyor between 1889-1892 so we can estimate and assume that he was in his late 30’s early 40’s at the start of WWI, therefore the age of the young man in the photo would not match John’s age at the time. 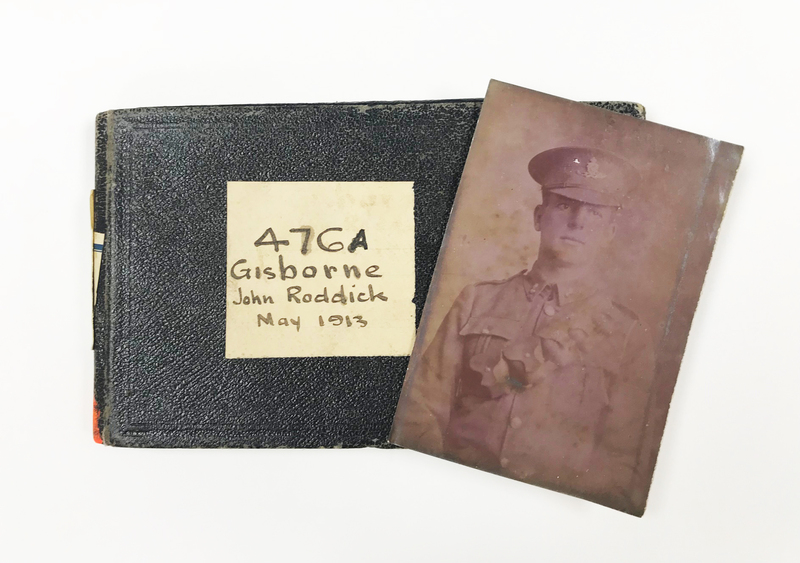 Still determined to find an answer, we searched on a number of online registers to find out if John Roddick served in the war. But we found no recorded results showing the name “John Roddick”. So, who is this man in the photograph, a relative maybe? Thanks to Papers Past we found an advertisement in the Poverty Bay Herald from 24 July 1920 for John Roddick and his surveying services. 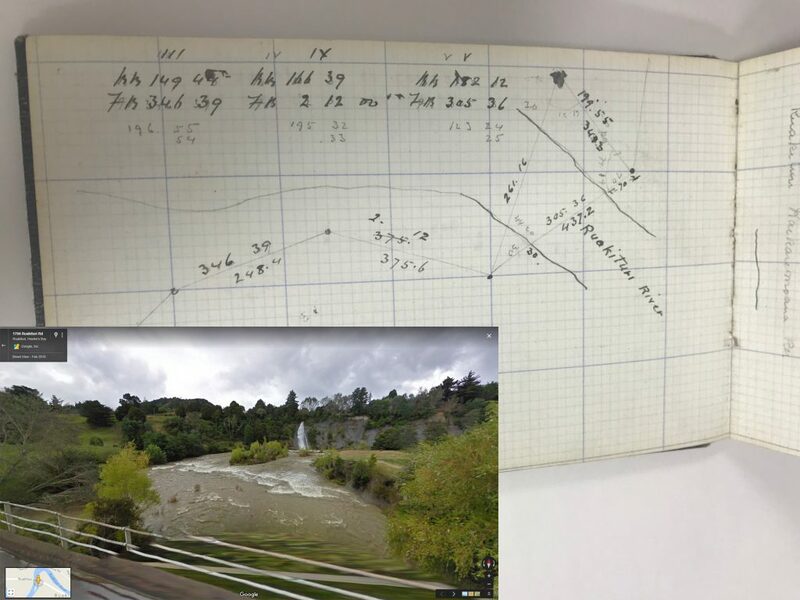 We know John was in this area as we traced the markings and inscriptions from the field book to the Ruakituri River near the Hawkes Bay area. Upon further research, we found another connection John has in the Gisborne area. In 2009, a Bay of Plenty resident, Mrs Helen Renner, wrote to Gisborne District Council to protest the name of Shortcut Road in Te Araroa which was previously known as Roddick Road, named after pioneering surveyor, John Roddick. The Council responded with a report outlining the implications of changing the name of the road. From their investigation about this issue they write – “The Tairawhiti Museum has confirmed there was a surveyor in Gisborne at that time, but has no further information on him.” Ultimately, in 2010, the Te Araroa Progressive Society decided the road will not be renamed to Roddick road and will continue to be Shortcut Road. A mystery still unsolved, will we ever know who this man in uniform is? Why did John Roddick carry his picture? If you know anything about John Roddick or have ideas of how else we can research to find out who this man in uniform is, please contact us.